Diaper bags have increasingly become the savior of all parents. Gone are the days of struggling to carry diapers, bottles, wipes, wipe warmers, diaper sprayers, milk and other essential baby items and accessories that you’ll need with you when you go out. For many years, parents would simply invest in a backpack or a rucksack to carry everything, but when your baby’s throwing a tantrum, and everything is simply thrown into a backpack, finding the item you need can become really difficult. Instead, having a fully-functional diaper bag with everything you need in its organized place is now an essential part of everyday life, making your life easier and free of the traditional stresses. This is simply one of the many benefits that diaper bags these days have. Below, you’ll find a comprehensive collection of some of my favorite diaper bags that are currently available. These are affordable, multi-function diaper bags that promise to leave you wondering what you ever did without them. 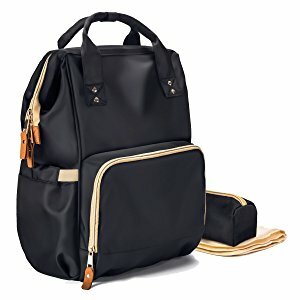 To start my list, I’ve chosen this luxurious yet extremely affordable diaper bag that comes with everything you need to alleviate the stresses of everyday life. This compact and lightweight bag maximizes space, giving you compartments and dedicated storage spaces to carry everything you need in the most organized way possible, allowing you to have access to everything you need instantly and without fuss. Within this bag, you’ll have enough space to carry three milk bottles, water bottles for yourself, baby clothes, towels, diapers and anything you need to take with you when you’re out and about. 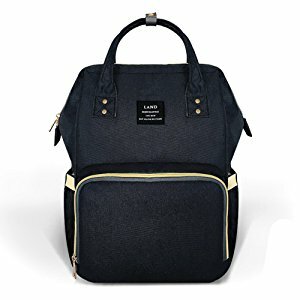 Additionally, this diaper bag is made from high-quality oxford fabric materials that provide you with outstanding levels of durability, ensuring that this is one diaper bag that will last for many years to come. Thanks to the quality of the fabric, you’ll also be able to enjoy the bonus easy-wipe and waterproof properties, so you won’t have to worry if you spill any water or milk on the bag. You can simply wipe it off in no time at all. What's Great About It: In addition to being a diaper bag, this bag is stylish enough to double up as a rucksack or a handbag, enabling you to save money in the long term by not having to pay out for another bag. With four unique designs to choose from, it’s easy to find a bag that suits you. 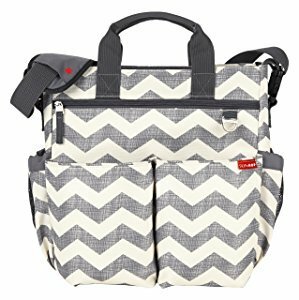 If you are looking for a designer bag that doubles as a diaper bag that you can take with you wherever you go, there’s no need to look further than the Hip Cub Diaper Bag. Available in three luxurious colors with a beautifully chic tan trim, you can be sure that you look great, whether you’re out and about or caring for your little bundle of joy. This over-arm tote bag prides itself on nine various storage compartments, giving you more than enough space to carry whatever accessories you need, no matter what your day consists of. Included with this purchase, you’ll be able to enjoy the added benefits of universal stroller straps, making it ideal for organizing your stroller when you’re carrying out your daily chores. It also includes a matching changing mat, providing you with incredible levels of versatility, no matter where you are or what you’re doing. What's Great About It: Thanks to the highly-durable exterior cotton materials, you won’t have to worry about spilling liquids or substances on the bag, usually resulting in stains. Due to this build, you can simply wipe away the substances without any risk of damaging the bag, ensuring this is a bag that’s built to last for many years to come. Available in seven unique and vibrant designs, with the Skip Hop Diaper Bag, you’ll be able to choose the ideal bag to match your personality. This incredibly affordable diaper bag provides you with four cleverly positioned interior pockets as well as seven versatile exterior compartments; perfect for storing everything you need, awarding you easy access to your essentials whenever you need them. There’s also a convenient front pocket for extra storage. What’s more, despite its compact and lightweight design, the high-quality materials mean the main storage area is capable of holding laptops, tablets and all your smart devices, giving you complete accessibility no matter what you’re up to during your days. The adjustable straps allow you to easily position the bag in the most comfortable and stress-free position, and can easily be converted into an organizer for your stroller. What's Great About It: To ensure that all of your baby’s belongings are secure at all times, this outstanding diaper bag comes with a handy and secure zip feature from end to end. Furthermore, there’s even a unique and comfortable cushioned changing mat, meaning that you can change your baby whenever and wherever you need to. 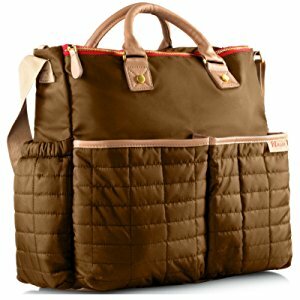 Produced from industry-leading nylon materials, the HapTim Diaper Bag is an incredibly stylish diaper bag that provides you with everything you need in addition to the many functions you would expect from a traditional diaper bag. Within this bag, you’ll be able to store all of your essentials, including diapers, food, drinks, clothing and anything else you need in the most organized way possible, with more than enough room to spare for your personal belongings. The straps on this bag are fully adjustable, meaning you can wear the bag in a rucksack style or over your shoulder. You can easily convert the universal straps for effortless use on your stroller, giving you more than enough room for everything you need on a day-to-day basis. What’s more, there are an incredible 13 pockets to utilize, allowing you to customize the organizational levels of your bag like never before. What's Great About It: Thanks to the high-quality nylon and PU backing materials that are used to create this bag, it boasts unbelievable strength that you won’t find with other bags. It is designed to last for many years while being fully resistant to water and other substances that spill onto your bag, allowing you to enjoy a pristine bag for ages. If you’re in need of a super-fashionable multifunctional tote diaper bag that gives you everything you need, including the ability to double up as a designer bag that you can use no matter what the occasion, the Maman diaper bag could be ideal for you. Within this diaper bag, you’ll find one large compartment with a secure internal pocket that boasts enough space to hold all of your personal items. On top of this, you’ll then find a complete collection of front and external pockets that are perfect for smartphones, wallets, keys, bottles, drinks, food, snacks and any other essential items that you can imagine. Furthermore, there’s an extremely handy and convenient changing pad that allows you to change your baby while on the move, making this one of the most complete diaper bags available. The materials used in this diaper bag pride themselves on their highly durable and waterproof properties, meaning that this is a bag that is built to last in pristine condition for many years, despite being so affordable. There are four colors and styles to choose from, allowing you to choose the one that suits you and your style effortlessly. What's Great About It: Thanks to the universal straps, you can easily carry this bag around with you as you go about your daily business, either over your shoulder or on your stroller, giving you the maximum level of organization, ensuring your day goes by with minimal stress. Boasting an incredible 24 liters of storage space, you’ll never need another bag again. The Hyblom bag gives you an outstanding level of comfort when wearing it. This is thanks to the padded shoulder straps in the backpack design, allowing you to effortlessly pack it as you’re leaving your home while enabling you to keep your hands free to handle all your business. The diaper bag itself is made from nylon fabrics with a padded mix of internal polyester linings, protecting your belongings while in transit in the strongest and most durable way possible. Inside the bag, you’ll find interior pockets that are made from elasticized materials, enabling you to comfortably fit all your possessions in various pockets as well as thermally insulated bottle pockets that help to keep your cold drinks cold and your hot drinks hot. Included with your purchase, you’ll find a highly-convenient changing mat for your baby and high-strength stroller straps to give you maximum comfort and accessibility to the bag. What's Great About It: With three unique, visually attractive styles to choose from, you’ll be spoilt for choice when it comes to selecting the ideal bag to suit you. This makes it perfect for any occasion, whether you’re out with your baby in the shops, enjoying a picnic in the park or socializing with family and friends. 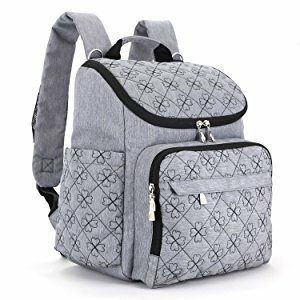 If you're in need of a stylish and luxurious diaper bag that gives you everything, you could want and need from a diaper bag while giving you the best look regardless of the occasion, the Cateep Baby Diaper Bag excels. 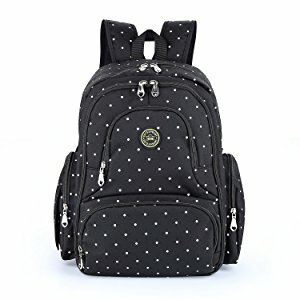 This backpack styled bag comes with multiple exterior pockets that have zips for secure storage as well as pockets with a magnetic buckle that grants you easy access to the most essential products in your diaper bag. What’s more, there are insulated thermal pockets to ensure the temperature of your heat-sensitive drinks, such as your baby’s milk, are maintained, and it's capable of holding up to three bottles. Inside the main compartment, you’ll find more internal padding pockets that are perfect for holding your more fragile personal belongings, including your smartphone or tablet, and there’s even enough room to hold laptop computers up to 15-inches in size. With this diaper bag, you can easily choose between a tote styled bag with a secure handle or the rucksack version with convertible straps that allow you to effortlessly attach the bag to your stroller for an even more convenient experience. What's Great About It: There are six different styles and designs, from elegant brown, black, and gray to more vibrant reds, giving you the unique ability to choose a bag that best matches your taste. When it comes to diaper bags, it’s understandable that you want to invest in the most high-quality product possible that will remain in good condition for many years to come. With this in mind, the Bag Nation Diaper Bag could be perfect for you. Enabling you to keep your hands free to carry out your day-to-day activities, this diaper bag sports a backpack design that’s both comfortable and versatile, giving you easy access to your belongings whenever you need them. The straps can even be attached to your stroller as an additional storage option, giving you unlimited opportunities to stay organized. The bag itself is made from extremely high-quality twill polyester materials that pride themselves on their waterproof properties, protecting the bag and your belongings from spilled liquid while maximizing the quality and lifespan of your bag. Included with your purchase, you’ll be able to enjoy the benefits of an included changing mat as well as a unique sundry bag, giving you everything you need for the best day-to-day experience. What's Great About It: Within this innovative and intuitive diaper bag, you’ll be able to maximize use of the 14 unique pockets both on the inside and outside of the bag. This enables you to stay organized and well-equipped, so you’ll never be stuck out of the house without the essentials you need. 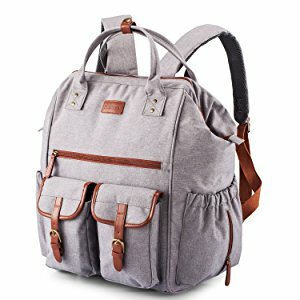 If you are seeking out a unique and innovative diaper bag that will last for many years to come, then LNGLAT may have a solution for you. With this environmentally friendly diaper bag, you can enjoy the outstanding benefits of a waterproof bag that you can easily wipe clean when there are any spills, ensuring your bag looks great all the time. 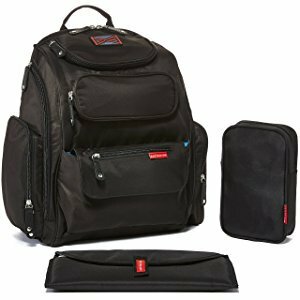 Due to the large size, despite remaining compact and lightweight, this bag boasts enough space for all your personal belongings including your phone, keys, and purse or wallet. Of course, there’s also room for your baby’s essential items including towels, wipes, diapers, bottles and clothes, giving you everything you need while you’re out and about. Thanks to the backpack design, this bag looks great whether you’re shopping, eating out or while you’re out on vacation, guaranteeing a happy and hassle-free experience, no matter what your plans are for the day. What's Great About It: Available in multiple designs and styles, this unisex bag looks great on both parents, enabling you to effortlessly share the load when out and about, so you can effectively tackle any problems that come up, ensuring a happy baby all day long. To conclude my list of favorites, I’ve chosen this multi-function backpack diaper bag that excels in every aspect. Eliminating the risks of achy shoulders, you can enjoy the many benefits of padded straps that boast breathable properties that fully support your back while carrying the bag, providing you with outstanding levels of comfort. Inside the bag, you’ll be able to enjoy maximum capacity thanks to the 15 unique and versatile pockets, ensuring everything has its own dedicated place, including laptops, tablets, phones, cameras as well as all your baby’s essential accessories. The bag itself is made from highly-durable waterproof twill polyester materials with an added genuine leather trim that maximizes the level of support and protection of your belongings while you’re out and about. Thanks to the functionality of the bag, you can take it with you anywhere with minimal effort, whether you’re carrying out your day-to-day tasks or going on holiday. What's Great About It: Easily the leading feature of this design is the style. 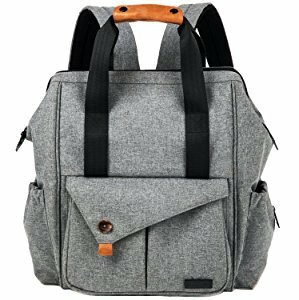 This unisex diaper bag is a professional and elegant gray design that highlights the leather trim. This means that it looks fantastic, no matter what the occasion or the event. One of the most difficult tasks you’ll face is choosing the right diaper bag for you. As you can see, there are a ton of high-quality bags to choose from. Using my step-by-step buying guide, the task can be effortlessly completed, allowing you to make the most educated purchasing decision possible. As you would expect, the main consideration you’ll want to look for in a diaper bag is the amount of storage it has, allowing you to easily fit in all of you and your baby’s belongings in an organized way that grants you easy access to the essentials when you need it the most. As you can see, there are a variety of sizes to choose between, from compact bags with 5-6 storage compartments to high-capacity bags that contain 15 storage compartments and up to 24 liters of space. When choosing your diaper bag, consider what items you’ll want to carry with you so you can choose the perfect bag for you. More in Diapering: What's the Best Pull-up Diaper for Your Baby? There are several considerations to think about when it comes to how long your bag will last. Firstly, consider the materials that are used to create the bag. Nylon or polyester are the most popular materials as they are strong and can withstand the weight you’ll be carrying. The second is the waterproof property of the bag. The chances are that you’ll spill water, milk and other liquids on your bag at some point, so you’ll want a bag that can easily be wiped off to preserve its lifespan. As a rule of thumb, the cheaper the bag you buy, and the cheaper the production materials are, the more likely it is to break. It’s best to pay a little bit extra for a mid to high range bag that will last rather than continuing to pay out for a bag every few months. More in Diapering: Which is the Best Overnight Diaper? As you’ll be carrying your bag around with you wherever you go, you want to ensure your bag provides you with maximum levels of comfort and support, so you don’t hurt yourself, especially if you’re carrying a lot of belongings. Some things to consider include padded straps to protect your shoulders as well as adjustable straps to ensure a comfortable fit. 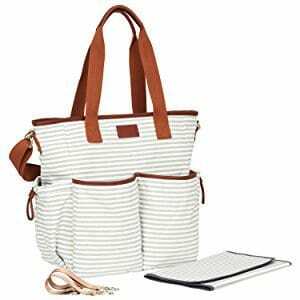 There are two main types of diaper bag available: a tote bag and a rucksack style bag. What you choose completely depends on your personal preference. The final consideration to remember is the design and style of your diaper bag. You could be taking your bag out with you as you carry out your day-to-day tasks. You may be going out for dinner in a restaurant or going on holiday. Whatever the occasion, take your time in choosing the perfect bag that you’ll love to wear, no matter what outfit you’re sporting. Taking your time to ensure you make the right purchasing decision can be extremely beneficial for you and your family in so many ways. It’s easy to go out and buy the first bag you see, but by listing out the belongings you’ll want as well as the style you prefer, you’ll be able to pinpoint the exact bag that suits you. This means you’ll be granted access to everything you need when you need it, ensuring every day that you're out and about is stress-free.